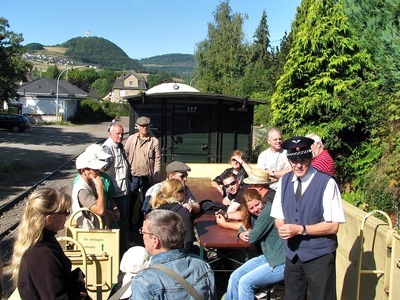 Experience the only 1000 mm Narrow Gauge Line in Rhineland Palatinate. “Vulkan-Expreß” will transport you to the best hiking and walking routes in Brohltal! Brohltalbahn - a special event also in winter. More Information will be available soon! Thank you for your patience. More than a train ride – by “Vulkan – Express” through the recreation area of Laacher See! A trip with our “Vulkan – Express” is more than a train ride. It is a relaxing experience, a real technical and nature event. It brings you close to the unique Laacher See area formed by ancient volcanoes and also makes you feel how hard the engines work to raise its train 400 meters from Rhine to the summit. Get on board an experience a unique narrow gauge line in the attractive countryside of Osteifel! You can travel on our historic “Vulkan – Express” all around the year to a dense timetable with added special events. Our trains always offer the right beginning of an eventful day – to start a summer hike through the lovely Eifel countryside or a winter trip into the snow covered Brohltal. You will notice at once that you begin a special journey as soon as you change from the modern air-conditioned trains of 'Mittelrheinbahn´(RB26) to our historic wagons . Equipped with wooden seats your journey is a step back in time! Windows that can be opened or the plush upholstery of 1st class compartments brings back memories of rail travel in the past. Especially for younger people it is a new experience! And a very special memory will stay after a ride in our special open summer wagon – enjoy the wind at a speed of 20 kilometers per hour and the panoramic view in all directions! Normal traction for our trains are diesel engines in the classic Brohltalbahn green and cream colours that pull our trains along the 17,5 km along line from Brohl/Rhein to Engeln. On the trip across some high viaducts and through an about 100 meter long tunnel the line risen for about 400 meters. You will experience how the engines have to develop their full power to get the train to Engeln on time. On special days our historic steam engine 11sm is in service. 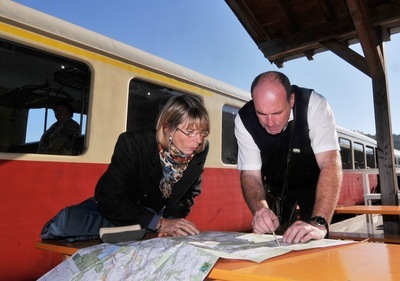 All information needed about timetable, prices and whatever you need for a ride on Brohltalbahn or a longer hike through fast forests or across the Eifel plains – one of our stations is always nearby. The stations at Bad Tönisstein, Weiler, Oberzissen and Engeln are well suited as starting points for longer hiking tours. Well marked trails lead you from Brohltal to places like Maria Laach at Laacher See, Adenau or Ahrtal and the Information Center of Vulkan Park in Mendig or Mayen. And from the other stations interesting round tours like geologically interesting ones or to caves and gorges can be started. For bikers the station at Engeln – 465 m above sea level – is an ideal starting point, without severe inclines you can let your bike roll downhill in nearly every direction. The easiest is the one through the Nette Valley and Schloss Bürresheim to Mayen and from there along old disused railway lines down to the station of Hatzenport at the river Mosel, nearly all downhill. Brohltal – Cycle track leads along the valley past Castle Olbrück to Niederzissen and through Vinxbachtal to Bad Breisig. Also recommendable is a tour through Kesselinger Tal to the railway station at Ahrbrück and further on along Ahrtal Cycle track, all well signposted. Feel free to ask our train staff for more information. The regular service is only possible because of voluntary staff doing most of the work either as train driver, ticket collector, guard or in the workshop or when laying track. In 1991 the railway was shortly before closure when Interessengemeinschaft Brohltal – Schmalspureisenbahn (IBS) as a club formed a new company to take over the running of the line. That saved the line and a perspective for the future was found. You are very welcome to support us. If you want to join IBS as a member you can find more information under IBS.